To enable the content library tool in Studio, you add the "library_content" key to the Advanced Module List on the Advanced Settings page. For more information, see Enable Additional Exercises and Tools. Grading is subject to the setting of this unit’s subsection or section. If the subsection or section is not graded, selecting True here has no impact. If the subsection or section is graded, this assignment is graded, even if you have selected False. To view the randomized content that was assigned to a specific learner, see Specific Student View. 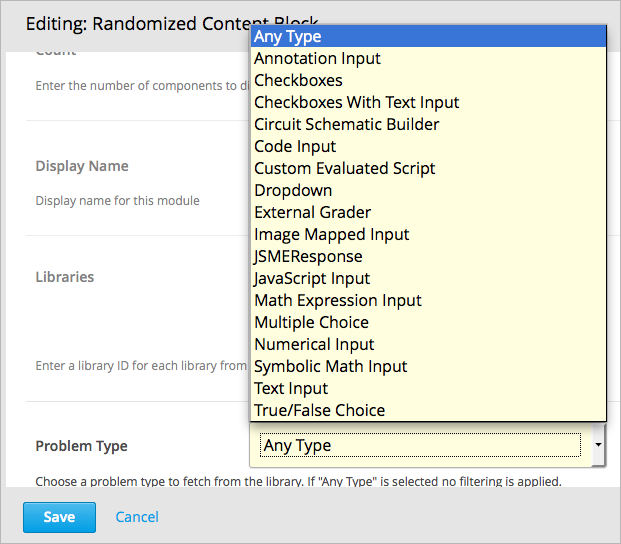 Be aware that if you make changes on a component’s Editor tab, if you update the randomized content block with the latest version of components from a library, these changes are overwritten. Only changes to a component’s Settings tab are retained when you update the component. For details about getting the latest versions of library content in a randomized content block, see Getting the Latest Version of Library Content. In a live course, to view the components that are assigned to a specific student from a randomized content block, follow the steps described in the Specific Student View topic. Obtain the username or email address for the learner whose grades you want to adjust, and follow the steps described in the Specific Student View topic to view the actual problems in the course that this student was assigned. In the Specific student course view in the LMS for the student whose username or email you entered, locate the components from the randomized content block. Follow the steps described in Adjust Grades to rescore the learner’s submission, reset attempts, or delete the learner’s state for a problem.